Sean Brennan is a multi-disciplinary guitarist and educator hailing from Baltimore, Maryland. As a performer, Sean specializes in contemporary music, and regularly works with living composers. He has given multiple world premieres of new solo and chamber works, including the works of Jordan Chase, Kyle Dubin, and Johnathan Hugendubler. In the beginning of 2018, he took part in a concert of the music of George Crumb, in a performance of his major work ‘Quest’. Shortly thereafter, he recorded the piece, and it has been preserved for posterity in the Library of Congress, along with countless other performances of Crumb’s work. In the fall of 2017, he performed with the Now Hear This ensemble in the east coast premiere of ‘Excelsior’ by composer and multi-instrumentalist Caleb Burhans. 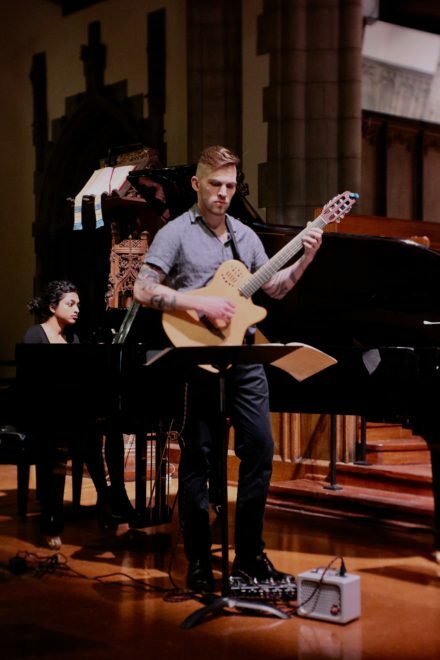 An avid chamber musician, he regularly performs with his quartet, Syzygy, which exclusively plays contemporary music, and Plectra, a guitar duo with Infinity Willner that specializes in arrangements of popular music along with standard classical repertoire. Other recent engagements have included the About/face concert series, Peabody on the Court concert series, Fret Festival, and the Blank Space concert series. As an educator, Sean has extensive experience over a wide range of students and teaching environments. He currently serves on the faculty of the Peabody Preparatory, teaching private and group lessons. At the college level, Sean has taught at the Peabody Institute, where he leads the guitar methods course for the Music Education department. In the fall of 2018, he will begin teaching applied guitar at the Notre Dame of Maryland University. Sean has also participated in Johns Hopkins research, where he has led guitar group classes for adults with Parkinson’s disease. His students have been accepted to the Peabody Institute of the Johns Hopkins University, Penn State University, and University of Tampa.